An unnamed glacier draining the west side of Yejyumaro Peak a Nepal-China border peak, into Tibet is referred to here as Yejyumaro Glacier. 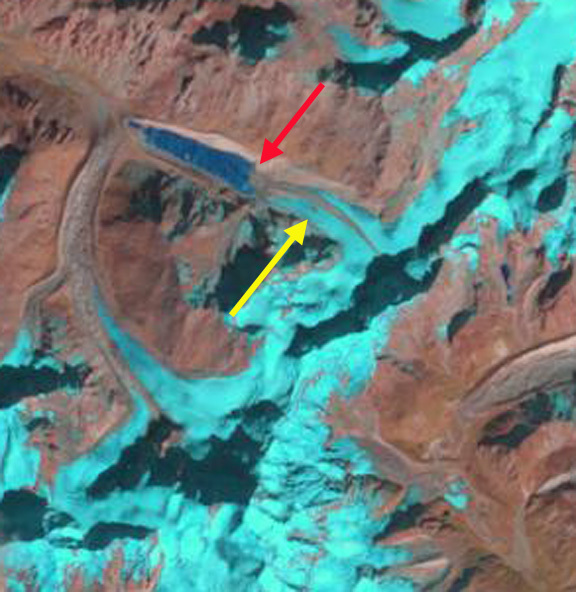 The glacier is at the headwaters of the Arun River, which crosses into Nepal at Kimathanka. 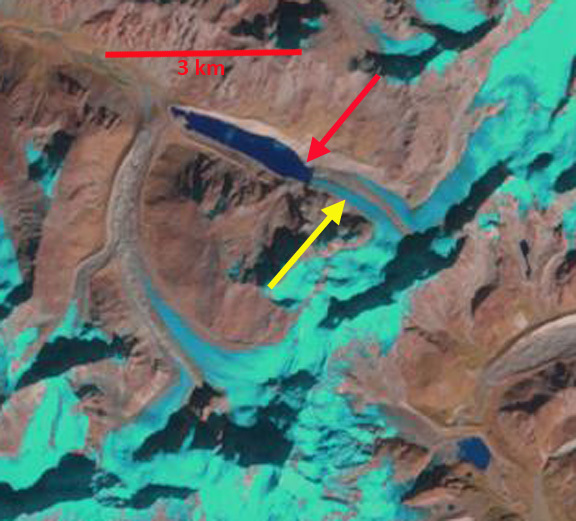 A 335 MW hydropower plant is being planned for the Upper Arun River fed by this and other glaciers. 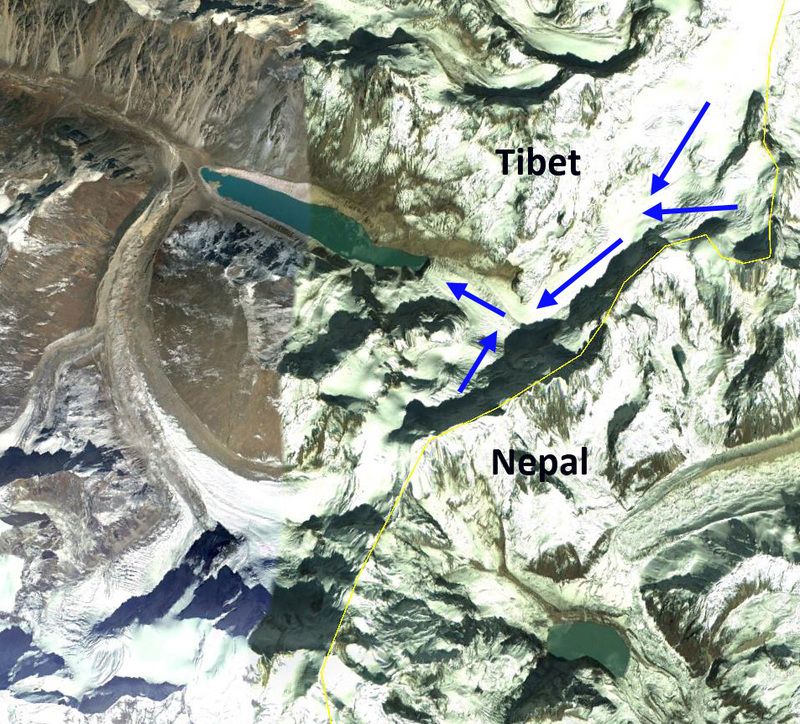 The glacier is adjacent to Nobuk Glacier across the border in Nepal. 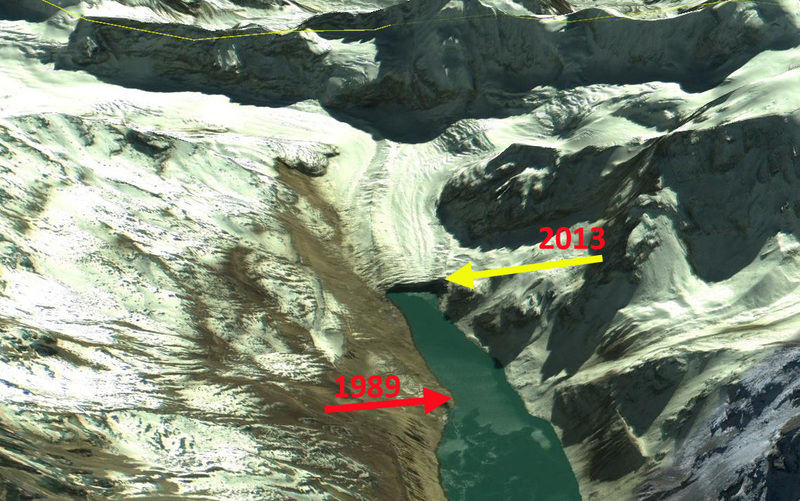 Google Earth images from 2002 and 2013 indicate both the glacier retreat and resulting lake expansion. Red arrow is the 1989 terminus position and yellow arrow 2013 terminus position. Notice the southern and northern arms joining and turning west. Both arms of the glacier are fed by the steep border peaks with considerable avalanching. 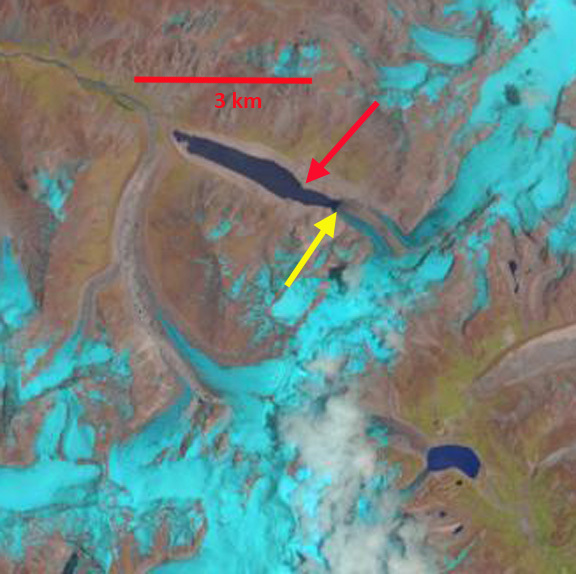 Landsat imagery from 1989 to 2013 is used to illustrate the response of this glacier to changing climate. In 1989 the glacier extended down the unnamed lake to a peninsula, with the lake being 2.3 km long. By 2000 the glacier had retreated from the peninsula, 150-200 m retreat since 1989. 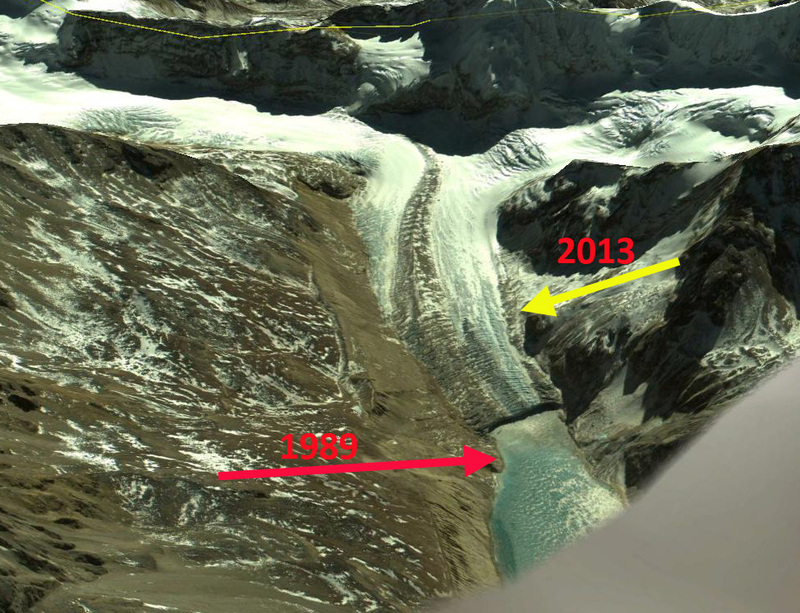 By October 2013 the glacier had retreated 700 m from the 1989 position into a narrower section of the lake. The lake is now 3 km long and still growing. A December 2013 image indicates how dry this region is during the early part of the winter with only a light snowcover across the glaciated areas and higher terrain. 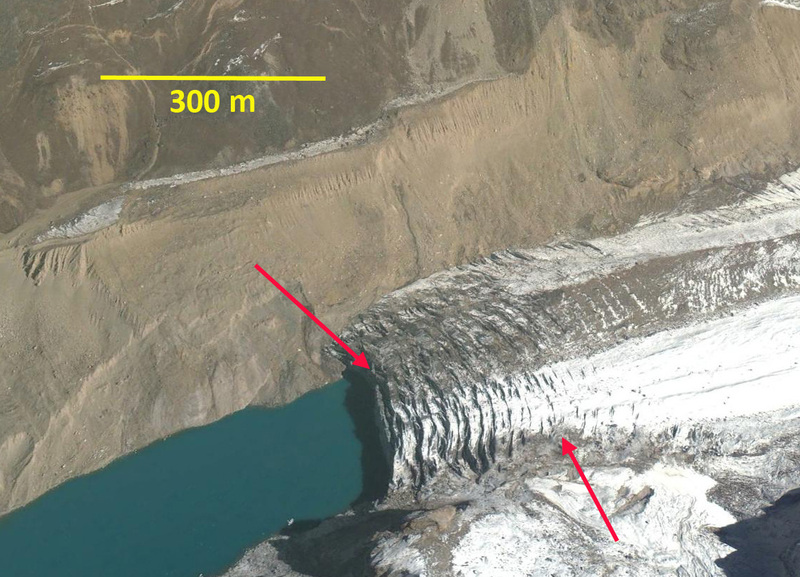 The last image is a the Google Earth closeup indicating the transverse crevasses that are above the terminus, the crevasses narrow moving up glacier away from the terminus and disappear 400 m above the terminus. These represent the acceleration near the calving front and the indicate that calving has helped accelerate glacier flow and glacier loss. This glaciers retreat is similar to so many in the area from Nepal such as the Nobuk Glacier that is adjacent to it in Nepal, and the many Tibetan glacier retreating along the the axis of expanding lakes, Reqiang, Matsang Tsanpo and Menlung Glacier. 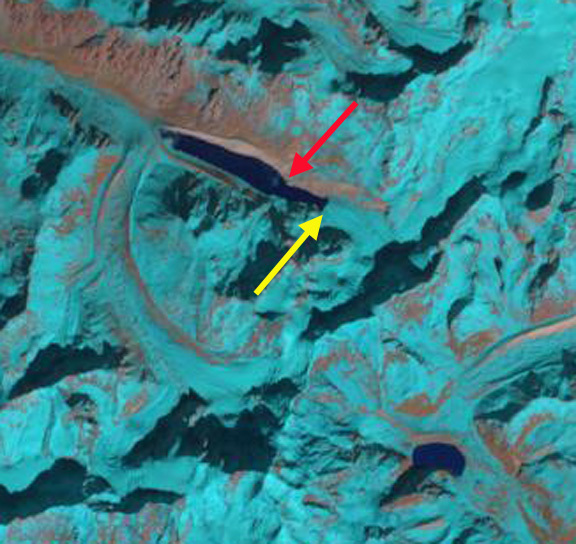 This entry was posted in Glacier Observations and tagged arun river glacier retreat, climate change glacier retreat, glacier retreat lake growth, Tibet glacier retreat, Yejyumaro glacier retreat. Bookmark the permalink.